July Fourth is likely the reason for a smaller than usual number of new releases out this week. We're still disgusted by Chris Brown's abusive actions a few years back and even more disgusted by how quickly the music industry has forgiven him, but he'll undoubtedly have the biggest new album this week. 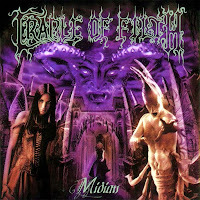 The Cradle of Filth reissues are much more exciting (Midian is pictured), as are the new records from Mike Patton and the Ictus Ensemble, Beak>, Prodigy, and just about everything else on the list below as well. A few artists like Antibalas are waiting until later in the week so a 7/7 release.